Welcome to Authentic Motherhood. A monthly series from A Mama Collective and Joyful Life interviewing inspiring women in the blogging community who are authentically living out their passions in motherhood. We hope you will be encouraged and inspired by the words of these amazing women. 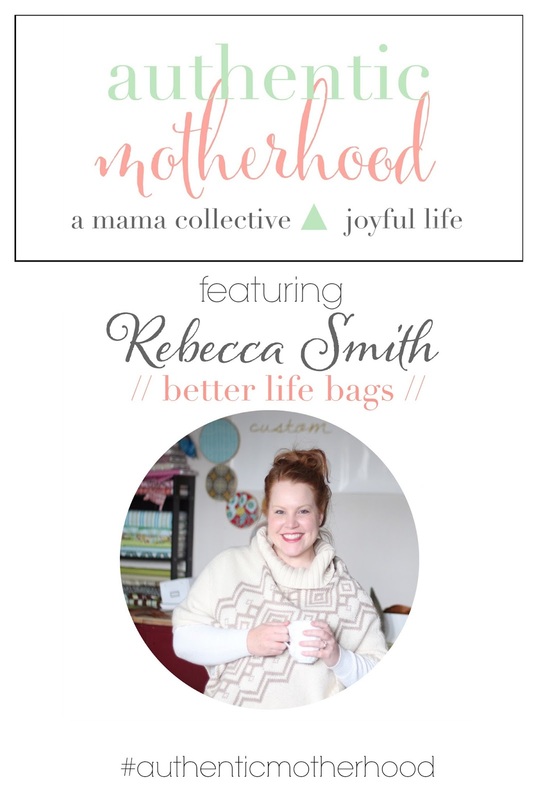 We are so excited to have Rebecca Smith of Better Life Bags as our feature for the month of May. Rebecca is someone Hannah of Joyful Life introduced me to, and I about died when I saw her amazing bags. We are honored to have Rebecca share a bit with us about her passion of BLB as well as her life as a mama. See what she has to say below. What is the mission behind Better Life Bags and how did it all begin? The mission of Better Life Bags is simple: to make lives better. It began as a “happy accident” in 2009 and has grown under the sovereignty of God to where it is today. When I was pregnant with my first, I decided to make a diaper bag for myself. After posting pictures on Facebook, requests for bags poured in from friends and family. I excitedly continued this new hobby but knew from the beginning that I wanted it to be more than a fun small business - I wanted it to be a business that was also a ministry. That began simply by using 10% of all revenue to help entrepreneurs in the developing world start or grow their business. A couple months later, we moved to Hamtramck, MI to live incarnationally in a multi-cultural inner city environment with the vision of loving our neighbors and following Jesus’ example. In the fall of 2011 everything seemed to fall into place. The business was growing, and my hobby was outgrowing my spare bedroom and my free time. I had developed a good friendship with a woman who was a recent immigrant to the US and unable to work because her religion and culture demanded that she not interact with or show her face to men. She was able to work for Better Life Bags from her home and earn money to help her family. She gained honor and respect for herself and eventually bought beds so her children no longer had to sleep on the floor! As it turns out, in the community of Hamtramck, there are lots of women who cannot work for religious and cultural reasons or because they lacked English skills. These women need an opportunity to earn money for their family and gain dignity in their community, but also to have friends who would show them Jesus’ love. We are honored to work alongside them. Better Life Bags are all 100% made in Hamtramck by recent immigrants who are paid above the living wage for our area. We seek to create wonderful, stylish, high quality handmade bags in an environment of grace, peace, and truth that lifts people up physically, socially, and spiritually. Can you tell us a little bit about your family? I have three kids: Jonah (age 4), Clara (age 3), and Corbin (4 months). My husband stays home full time with the kids while I work at Better Life Bags. This wasn't always our set-up and it may not be our set-up forever, but for right now it's working. My husband is an incredible father with endless patience and tireless energy to serve those around him. Our family moved to Hamtramck, MI (right in the middle of Detroit) on purpose about 4 years ago in order to love those who need love and serve those who need served. It has been a joy to be a missional family to our neighbors and invest deeply in our community like Jesus might have. What have you found to be the biggest challenge in motherhood? Accepting myself for who I am as a mom. I don't cloth diaper (anymore). I don't make my own baby food (anymore). I can't afford organic food. My house is rarely cleaned. It takes a LOT of effort for me to sit on the floor and play with my kids. I don't meal plan. And I had c-sections with all of my kids. There is much pressure to do the opposite of all those things in Internet-land and it has taken (and still is taking) mounds of Truth to overcome the guilt. I just wish we could all write from a place of experience and not push our convictions on other women as truth. What has been your greatest joy in motherhood? Seeing the little personalities of my children emerge. It starts for my kids around age two, and I am tempted to keep having kids just to discover their attitudes and passions. But, I'm not sure that's a good reason to keep getting pregnant. To ask questions and listen to their minds create responses that a true to their reality is fascinating. And, of course, I try to capture it all on my video camera. How do you balance your blog life / business and family life? Ha. The million dollar question! We don't have a specific plan to keep balance in place, but instead are constantly taking a temperature on how we are doing. Some weeks may be heavier on the work side, so I make sure to leave work early the next week to spend more time with family. Since we moved the business out of our spare bedroom and home, I've found the balance to be easier. I leave work at work (except for social media) and focus on home when I'm at home. How is your motherhood affected by your passions? I NEED to create in order to breathe. I know that sounds overly dramatic, but for me it's true. And this transfers over into motherhood pretty seamlessly. I like to create behind my camera and take pictures of my kids at all hours of the day. We subscribe to Kiwi Crate so that I can have easy crafts to do with the kids when we have a few moments. We have three different art stations in our house to encourage creativity. I've noticed my son creating diagrams of things he is going to build with the empty boxes we get at Better Life Bags and that just thrills my heart. What is one piece of advice you have for other moms who would like to live out their passions? Find time to pursue them. Naptimes, bedtime, hire a babysitter for a few hours a week. And shamelessly pursue them. You don't have to apologize for having passions and making time to do them. You will be a better mom if you take time to chase after the things that make your heart alive. Thank you to Rebecca for being a part of our Authentic Motherhood series.